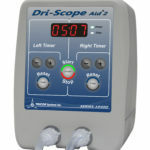 Dri-Scope Aid® Cabinet converts existing scope cabinets into a drying system. Elgin, IL – TRICOR Systems Inc. designer and manufacturer of the Dri-Scope Aid® and Dri-Scope Aid® 2 is excited to announce the launch of the Dri-Scope Aid® Cabinet (DSAC) system. The DSAC converts existing scope cabinets into a drying system. Up to 16 endoscopes can be processed with a short cycle for between uses and a longer venting cycle for overnight storage. Assisting in the drying process by pumping HEPA-filtered air through the internal channels of endoscopes, the DSAC helps reduce the chances of biofilm development and microbial growth due to water born bacteria. 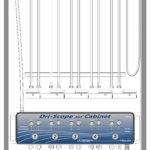 The Dri-Scope Aid® Cabinet also includes an easily identifiable visual display indicating the current status of the endoscope. 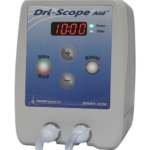 The Dri-Scope Aid® Cabinet comes in a few different sizes allowing for up to 16 scopes depending on your current scope cabinets. Using the individual scope connectors, it will hook up to all major brands of endoscopes. The scope connectors help to alleviate concerns over cross contamination. TRICOR is a small, progressive business actively involved for 40+ years in the design, development, and manufacture of military, aerospace and medical electronic equipment / instrumentation, as well as various other products including software. TRICOR’s ability for a quick turn-around from product inception to delivery is what sets us apart from our competitors. TRICOR customers include many Fortune 500 companies within the aerospace, defense and medical industries. TRICOR Systems is an FDA registered facility and is certified to: ISO13485:2003, ISO9001:2008, and AS9100C.